As you begin to read this post, I already know there is a part of you that is ready to serve. That wants to help others heal, feel happier, and make a difference in the world. Perhaps you’re a teacher, a life coach, or a yoga instructor. Whatever your title, there is a communal sense of wanting to elevate, expand your reach, and be known for making a true impact on us all. I feel this because that’s me at my core. Every since I was young, I knew I was meant to have a bright future that would involve reaching out to the masses. I had no idea of the context, but it was going to be special! Life had an interesting way of showing me how when I lost my way in my early 20s. I didn’t fit into the post college mode and I couldn’t seem to find anything that brought me fulfillment and joy. So I found drinking and other activities that would distract me until one day even that wasn’t enough. It led me to get help and figure out what it meant to love myself like I did when I was young and discover my purpose. I was realigned with my desires for greatness and also realizing that I was to help others that lost their way. I pursued life coaching and teaching meditation as my new career and there was no greater feeling than giving people permission and space to feel good. In time, I found that bringing in my love of metaphysical + spiritual studies could help people even further and as a coach it was a magnetizing blend. And so as you read all of this, it sounds quite simple. Girl gets lost. Girl finds her way. Girl helps others. Girl has a thriving career. All is freaking fantastic. I wish it was that easy, but it wasn’t. It took me a few years to be able to be full time doing the work that I loved. It also meant several failed attempts that left me shameful, broke, and scared. The biggest one was when I left my Corporate job on the eve of my 30th birthday (2 + half years ago) to be a life coach full time. I was living on a Manhattan budget with 4 months savings and no steady clients. I had just started reading about the law of attraction and watching Abraham Hicks videos and I thought if I just believed and wanted it bad enough, everything would fall into place and I would attract everything I needed. I was so confident that I booked a trip to Vegas before starting my new venture as well as a music festival weekend in Atlanta. It was all going to work out because I wanted it to. I had it all wrong. By the time I was 2 months in, I was living on oatmeal, eggs, and the Starbucks gift cards my Dad sent me every week. I found a side job as a host for an event company that paid me under the table. I would shove leftover dinner rolls into my bag and walk 2 miles home instead of paying for the subway. I hardly slept and I was deep in fear. The crazy part was that fear didn’t so much have to do with not paying the bills as much as it involved the embarrassment of my failing business. I had my sights set so high and was confident in my relaying to everyone how wonderful and prosperous this would be. I saw so many others in my industry boost about making lots of cash and how easy it seemed. I didn’t understand why them and not me. I was disappointed that I wasn’t making a difference and helping people transform; and further, I was frustrated that I wasn’t making a fruitful income like I hoped for. Eventually, my money ran out and with much defiance yet no other options besides moving in with my parents, I got another Corporate job. It wasn’t until that role that I started to see my mistakes with manifesting and how I was treating money. And as often as that job didn’t always feel fulfilling, it did support me. And it gave me the security to continue to live in NYC, try things out in my business, and most importantly, take it responsibility and seriously. It also brought me to my mentor Gabby Bernstein and her Spirit Junkie Masterclass. Eventually, I was able to leave that job and it was because my business had taken on a clear direction, steady following, and the work was becoming too much to manage between both roles. I also learned to value and respect my money, not just plead with the universe to give it to me. There has to be an ebb and flow of giving and receiving, along with a sweet note of gratitude for abundance to really come into our lives. We all have different journeys and if you’re ready to serve others or start your own business, realize that it will happen in a way that is truly defined and tailored for you. It’s okay to have high standards. However you have to earn them first! Personally, I just wanted the sweet style of life without taking the time to create the foundation for it to happen upon. The first step is to feel and harness your desires and then backtrack to build the arc to house them. While the coaching work I wanted to do came from a pure, good place, it wasn’t enough to just want to help people, I needed to put in the effort as to how and then embody it. That sets the tone and then more can come from there! Redefine what success looks like. There are many people with online businesses that showcase more about their earning capacity and high-level opportunities than actually talking about what it is they do to help serve others. And there’s no judgement in that. The thing to realize however is that if you want to have an online business, it doesn’t mean you have to now also be a millionaire. Maybe you’re a stay at home mom and would like to make enough to fun the family vacation or perhaps you actually like your day job and doing acts of service on the side bring you joy. Remember that how other people handle their business is not the way you have to! Focus on the passion aspect first and then you can bring the money aspect in. Remember why you started. Most often, the reason many of us start a business or become a life coach or healer is because there is a problem that we can help solve. We awakened to it in some way and it drives us to our core until we do something about it. Though somewhere along the way, the whole thing became capitalized and it’s turned more into a money game than a self help phenomena. Trust that you will be supported financially if you love what you do and you’re clear on how you wish to implement it. And you deserve to make as much money as you want or need. I encourage it! It’s not until you get into a space that you are aligned and confident around finances that you’ll really be able to do the work that you need to do. I had to learn that before I could successfully run my own business, I had to bust through the money stuff so I could feel open and expansive and ready to help others and serve in that oh so big way. All of this I had to learn on my own, but that doesn’t have to be the case for you. Take time to access how money plays a part in your life and how it holds you back. Do you let it be an excuse that stops you from being great? Or does it limit your potential to express your talents? Whatever the case, I’m happy to know that there are people dedicated now to helping you through the chaos of cash, so you can be happy, at ease, and doing work you love. I mainly have to give it to my home girl, Amanda Frances, who’s Money Mentality Makeover is literally changing the lives of entrepreneurs and giving people permission to live an abundant life while doing really beautiful heart centered work. You can learn all about the program here! And because I’m so onboard with all of this (and kinda jealous I didn’t have this 3 years ago but you do!) I’m offering my Cosmic Moon Course, launching this Spring, absolutely free! The Moon course gives you the opportunity to learn about how the Moon relates to Astrology, how the cycles work, and even how to apply your new money manifesting skills to New + Full Moon rituals! It’s a 4 week digital program that is so much fun and I’d love to have you onboard! I’ll leave you with this money meditation, trusting that the clarity, ease, and respect of abundance flows through you naturally, that you allow in the help to elevate higher and to know that all is working out for your highest good. So good right? And when you sign up for Amanda’s course, let me know about it too! Email me at danielle@daniellemercurio.com so we can celebrate the next chapter! Still not sure if the course is right for you? Check out the free training on earning money as a natural extension of your being! Click here for access! 2015 Astrology Forecast – January’s Capricorn Sun & Cancer Full Moon! We are in that beautiful moment at the start of the year when everything and anything seems possible. Unlimited new beginnings, business ventures, healthy ambitions and elevating love all are set in our sights. We are ready to leave behind what didn’t serve us in the past year. And there was much. 2014 brought forth many shake ups, hardships and bold shifts into our lives. We had to face much and in turn lessons were presented. We were shown our resilience and strength, our ability to adapt, and most importantly, our capacity to trust was accelerated. This was all in due course to present you with the gateway to more peace, prosperity and abundance into 2015. We cannot be grateful for the gains if we didn’t appreciate the glorious comebacks we were pushed to make. Before you get too far ahead of yourself into the New Year, take the time to honor the past, the teachings that were presented and the messages you followed. For you wouldn’t be here, in this very moment, beaming with pride and faith for the future otherwise! January truly does set us off in a wonderful tone for the year ahead. Major trends are cultivation, lifting final blocks and a sense of freshness. We continue to move through the Sun in Capricorn, which is a time for focusing on our goals, organization and structure. Continue to comb through the areas of your life you are ready to put the work into. Remember that you must be willing to give what you are asking to receive. In numerological terms, 2015 adds up to 8 and is the year of abundance and infinite prospects! Note however, this will come together when combined with hard work, clarity and patience. So take advantage of this Sun direction to really get laser sharp on what you truly want to manifest and how will go about doing so. No need to get too far ahead of yourself either. By getting clear on the intentional first steps of a goal, you’ll find that move guidance will come once put into motion. Look at your relationship with the Universe as a partnership and the two of you are building something grand together! The Full Moon will enter Cancer on January 4th at 11:53PM EST. The full moon embodies taking action and elevation to the next level. Perhaps you had set intentions during the last New Moon/Winter Solstice or are just ready to escalate your New Year’s intentions. Whatever it may be, take this time to offer them up to the universe and go easy on yourself in the process. With the moon in the governing sign of Cancer, it is about mothering, nurturing and inner healing. It’s easy to get excited in the realm of new beginnings, however stray from going so big that you overwhelm yourself! Set reasonable expectations and infuse them with a loving heart. Goals created in love over haste are surely to grow brighter and richer. The Sun will move into Aquarius on January 21st. This is a time to focus on your independence and personal freedom. You will also be moving into a generous and giving mode and you should take advantage to see where you can best serve! Protect yourself first and make sure your needs are met too. It’s a lot harder to provide for others when you haven’t made yourself a priority. Watch out for burn out and schedule lots of time for rest and restoration. The New Moon goes in Aquarius the day prior and again it’s a time to reflect on what you would like to put out into the world and receive back just as fully. Brace yourself as we slip into Mercury Retrograde also on January 21st until February 11th. This planetary transit occurs alongside the Aquarian Sun which is actually a good position for it to be in. Utilize the power it provides the inner self to see things from a different perspective. Get yourself super prepared before this date hits, back up your computer and don’t overload your schedule. This isn’t the time to make decisions that involve others. This retrograde will open you up to deep inner knowledge and I encourage you to take advantage of the innovative thoughts that may arise. It will allow you to think more outside the box and be less afraid to speak your truth. Keep a steady mind and use good judgment. As always, I invite you to use this as an opportunity to rise above the Mercury Retrograde and let your inner wisdom shine out! For January’s card reading, I pulled from Sonia Choquette’s Oracle Deck, “The Answer is Simple”. 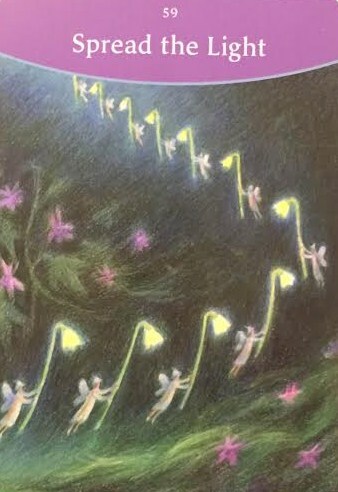 Upon answering for the guidance in your best interest for the month ahead, I received the card “Spread the Light”. This goes perfectly with the Aquarius Sun urging us to be the light to not only help others but realize our inner truth as well. You are powerful and inspirational and it can even heal those around you. One of the most potent healing acts of Spirit is to witness and acknowledge its light in others. Look around and notice who’s in need of being seen. Notice those whose light of Spirit is dim or at risk of going out, and reignite their fire with your recognition. Tell others that you love their Spirit. Don’t be afraid to speak this out loud. To be seen in the light of your soul is a very healing experience and easily spread. Give compliments. Acknowledge when someone is helping you. Write a letter to an elder. Give an extra tip to your server. Smile more. Use people’s names. See the light in someone whom you have the most trouble appreciating. These are all acts of healing in their own rite. This will heal you. You’ve been called to spread the light! Enjoy. Aries (Mar 21st-Apr 20th) What does 2015 have in store for you? This is a question you constantly seem to keep asking yourself. The last few years have been a lot of fun; filled with new adventures, friendships, and even romance. And you’ve worked hard through the course of it all as productivity is the key to your life force. However where has all of this led you? Is this the lifestyle you want to maintain going forward? As these thoughts continue to run through your mind, I encourage you to take the time out to journal and reflect on who you are. What is it that YOU love to do? What does your ideal partner feel like? What does it look like to put in a solid day of work? Freely write through all of these questions and then assess how your current situation compares. Take an honest look and explore how you want to fill in the gaps or what needs to shift. Understand that the world is full of limitless possibilities and you don’t have to settle at the first one. Use your bravery to invite in the one that speaks truest to your heart. Taurus (Apr 21st-May 20th) Time to get back to work! You may have strayed over the last few months from some of your daily obligations and responsibilities as new situations made you question how you see the world. You may have even felt like you wanted to isolate yourself at times. As we move into 2015, it’s a chance to reassess how you’re getting back into the game again. You’re a natural when it comes to hard work and dedication, so this will be no sweat for you. Make some calculated decisions that incorporate your recently adapted way of being and also understand that the universe is creating a more steady structure for you. Balance will be a more common theme for you once again! Gemini (May 21st-Jun 20th) You blossom into 2015 with your usual sense of light hearted playfulness and excitement! You love any opportunity to wipe the slate clean and renew your soul again. And this is a year it is definitely welcomed to do so! You are particularly optimistic right now when it comes to your love life, career and finances. Your head is in the cosmos and nothing seems to faze you at this point in time. While this is a beautiful space to exist in, there may be moments where you will be called to be a bit more grounded. It’s wonderful to dream however you must be willing to put in the work too. That means actually asking for the raise with the evidence to back up why or creating a real dating account instead of opting for just using photos on Tinder. All your anticipation is truly well received and just allow yourself to take it a step further. That combination will make you wildly irresistible and unstoppable! Cancer (Jun 21st-Jul 22nd) Right now everything seems to be falling into place, especially in your home life. All is coming together as you always saw it, the right partner, beautiful home and loving family. Take this opportunity to be grateful for your blessings and acknowledge this to those you love as well. It will only enhance the feelings of devotion and happiness and create deeper harmony. Continue to make time for family and friends. Throw a party just for the sake of it or bring homemade cookies to work! By continue to share your gifts, you’ll feel just as delighted as those who receive them. Leo (Jul 23rd-Aug 22nd) Everything has been going your way these days, however at the same time you know they could be even better too! This month is great opportunity to review your daily routine, projects and aspirations. Look closely to where you may be unnecessarily burning your energy. You don’t always have to say yes to every opportunity that comes your way! You are a natural leader and very likable, as such people are naturally drawn to you. Know that with any situation you have to turn away; another will resurface when you are ready for it. Continue to stay organized and prioritize your top goals for 2015. Trim off anything that doesn’t serve your highest self and purpose. It may feel odd at first to take things away, however you’ll grow into the new space and see how much more of a rock star you can be! Virgo (Aug 23-Sep 22nd) You’re starting off the New Year with your hands full! You have more projects on your plate than feasible however if anyone from the zodiac can handle it, it’s you dear Virgo. With so much going on, it’s easy to start to get caught up in comparison, miss small details, or be hard on yourself for your ability to keep up. Trust that all will be worked through and know when to ask for help. Also try not to take on anything additional at this time – unless it’s considered to be a form of fun! Keep smiling bright and remind yourself why you love what you do if ever feeling discouraged. Everything you’ve always wished for is coming true and there is more on the horizon! Libra (Sep 23rd-Oct 22nd) Woo! You’ve come out of the battle zone, and were quite victorious! The end of the year may have felt like you were in constant state of damage control and it was only to get you ready for the clean slate of what is to come. It may have not have been realized; however the universe has been looking out for you. It just needed to remove some of the blocks that were holding you back from living a happier and more peaceful existence. What will you do with this new space and openness that has been created? You’re in a beautiful position to start up anywhere you see fit and you’ll continually have the energetic force of the cosmos to back you. Clean up any last loose ends and get really ready to have some fun! Scorpio (Oct 23rd-Nov 21st) You’re a bit more quiet this month, in fact, it’s almost as if you’re more free and just in awe while adjusting to feelings of newness and expansion. Enjoy it! January is an opportunity for you to relax and just feel good in your skin. You don’t need to overstress at work or worry about what’s happening with your love life. You can just exhale, be present, and get excited about what’s in store for you this year! In the past, you may have had a tendency to get upset when things wouldn’t go your way and it would karmically create more push back. In this new state of being, you’re able to demonstrate patience and flow into what it rightfully yours. It’s such an easier way to exist! So delight as you loosen your sails and move forward positively into the world. Sagittarius (Nov 22nd-Dec 21st) It’s time to break out! At the end of December, Saturn moved out of it’s staycation in Scorpio and into your sign. At first, the shift may have created some physical and personal discomfort for you (and could be still), however know this will dissipate soon and you’ll be in a power position to reassess where you’re heading next. Saturn brings with it a sense of maturity. It’s a time to look closer into what your life looks like below the surface and where you are really ready to make a change. Quite simply, the moment has come and the hour to step it up has arisen. It’s a scary thought however I assure you it is nothing you are incapable of. You don’t need to shy away or laugh off what you truly want. There is so much in store for you and now is opportunity to really work your magic! Capricorn (Dec 22nd-Jan 20th) It’s one of your favorite times of the year! Not only are you celebrating a birthday, it’s also the New Year, a time of setting ambitions and figuring out how you’ll meet your target. You may be feeling a need for more security and stability, especially around money. Do not feed into your goat mentality and do anything drastic! Keep reminding yourself that a slow build creates fruitful results. Everything you need will continue to be provided for you, that is if you allow yourself to let go of some of the tight control and just let yourself flow through your daily routine. The end results will be the same, except there will be a lot less worry involved! Aquarius (Jan 21st-Feb 18th) As you move closer to your birthday, you may start to feel a boost of inner strength. In the years prior, you may have not been okay with following everyone’s line of judgment, however you did so anyway and preferably with a smile. This time around, things are different. You have been building your confidence and in turn finding you have a voice that needs to be heard. Your worth is just as valuable as anyone else’s and it’s time to start turning the tables! Raise your hand in the board meeting when you have a good idea, start a conversation on Facebook about an important topic, or simply be the one that gets to decide where you go to dinner with your friends. Don’t be afraid to work out yourself, in doing so you’ll be able to help so many more people in the process. The more you honor the inner you, the more your outer world will shift and reflect what you need to thrive! Pisces (Feb 19th-Mar 20th) You begin the year starting to feel more restless. You still don’t have all the answers you’ve been hoping for, however there is a sense of renewed drive you haven’t felt in some time. How can you start to take action to the dreams you’ve been cultivating? In the most beautiful sense, you dream big however at the same time it can be so large that it feels overwhelming to even consider getting started. Break down your goals very gently and create tangible tasks that feel manageable around them. Take it day by day and slowly but surely you’ll start to move into real progress. Make this your year to finally turn those deep visions into a reality!